This little bell brooch is representative not only of the local interest in bellringing but also of its history throughout Nidderdale, especially in relation to the Middlesmoor Bell Festival which originated in 1868 and continues to be held on or around 11th June, St Barnabas Day. 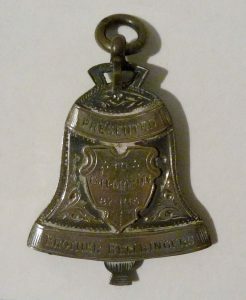 The small flat brooch pendant bell is made of silver and engraved as follows: ‘presented to G. H. Mason by his brother bellringers’. It was given to him in 1904 just before he left to start a new life in Canada. Listening to the bells whilst standing in the churchyard of Middlesmoor St Chad’s, at the head of the dale and looking down the valley with its breathtaking views, is one of the most rewarding things to do in Nidderdale.